The registration process of the pottery continues. As I progress it becomes clearer that the ceramic material varies within the different trenches as well as between the trenches. The pottery from the middle trench has long since been registered and the pottery from the western trench will soon be registered as well. However, since the registration is ongoing there are currently no exact numbers to be presented, but what I can discuss is that the image that I presented concerning the ceramics in the eastern trench, does not apply for the ceramic material from the site as a whole. Within the eastern trench, the pile dwelling pottery (PDP) is in abundance, followed by a smaller amount of pitted ware pottery (PWC) sherds and only a few sherds of funnel beaker pottery (FBC) are present in the material. 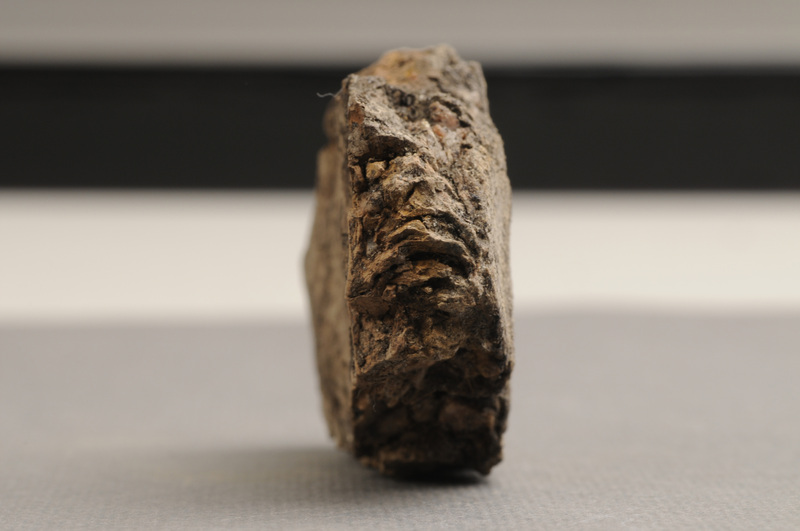 Even so, most sherds from the trench are unidentified due to the fragmentation of the material. As I registered the material from the middle trench it became clear that the different groups that were defined within the eastern trench have many variations, especially the PDP. It ranges from being tempered with crushed granite to being tempered with extremely rounded grains of gravel and the uses of different temper can sometimes vary within the same sherd. The vessel building technique can be either u- or n-technique, and the décor varies a lot, with a tendency towards more FBC-like décor elements. A pile dwelling pottery sherd (FID1186332). The sherd is made by means of the u-technique which is especially highlighted in the picture. Photo: Nathalie Hinders, SHMM. Having said that, I find myself in the midst of a ceramic spectrum, where it has become more difficult to determine the different sherds as either FBC, PWC or PDP, a large number of sherds are unidentified unfortunately. It is hard to determine where the characteristics of one ceramic style end and the other one begins. The so called ceramic spectrum is of course a sign of the fact that the different ceramic styles present at the pile dwelling are not that clear cut, and the question is: can the pottery at the pile dwelling be divided in different groups? Yet, there are differences between one sherd and another, and the differences are both interesting and puzzling, but at a larger scale they tend to be more logical and the spectrum comes back into place. 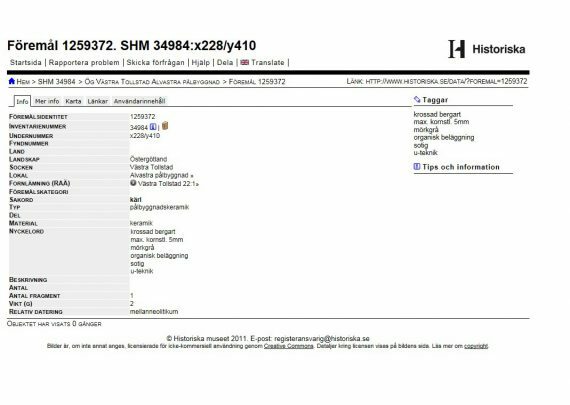 Excerpt from Sök i samlingarna, the web based version of our database which is updated continously as we register finds in the museum database. The picture displays what a post looks like and all the information that is added. I hope that the results of the registration can shed additional light on the characteristics of the different ceramic styles present at the pile dwelling. The many parameters that concern the technological aspect of the pottery can quite possibly show correlations between sherd thickness and maximum grain size of temper or choice of temper and décor – only to give a few examples of what this arduous registration can result in. It is important to bear in mind, however, that my hopes and expectations are one thing and the information in the database is another; there is a possibility that there are no clear correlations to be seen in the database. Nevertheless, I continue my work with registering the ceramic spectrum and I hope that I can present something graspable for you soon. Thank you for giving me energy in continuing the registration until the last sherd! It is true that the potters, with good probability, would have had a certain style to which they kept for at least a few vessels. I am looking forward to discussing the reslts of the registration with you!